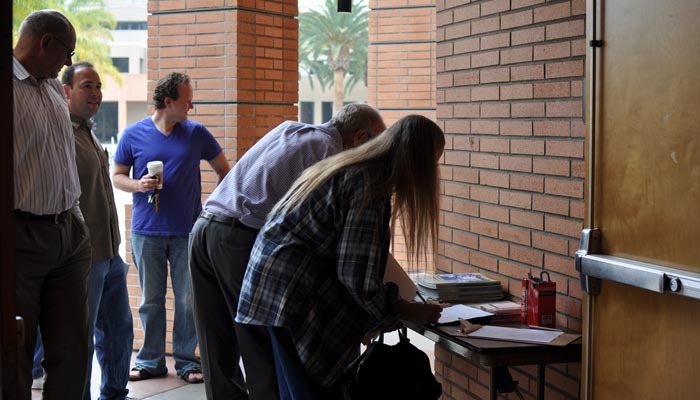 Tensions spilled out from the Noski Auditorium June 25 at a California Faculty Association meeting as CSUN faculty from various departments voiced their opinions about voting for layoffs or furloughs. CFA board members refused to vote at a meeting on June 23 for either option. 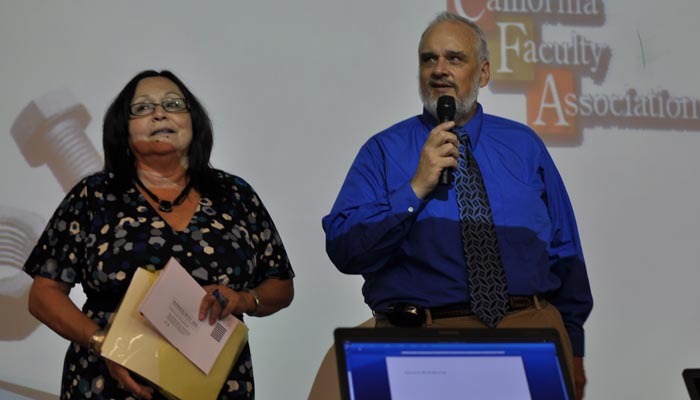 Ballard, along with Theresa Montaño, the other acting co-president of the CFA and a professor of Chicana/Chicano studies, moderated the meeting as they answered concerned faculty members’ questions and comments. Statewide CFA Treasurer and a faculty member at California State University, Long Beach, Peter Kreysa, also attended the meeting to help Montaño and Ballard calm the passionate crowd of academics with facts and figures. Ballard opened by reading a letter from CSUN’s provost, Harry Hellenbrand, who wasn’t present at the meeting. Hellenbrand said voting to send a message to Sacramento or the CSU administration wouldn’t be the right answer because they don’t embrace the issue like the individual campuses do. “Vote with your conscience,” he said. As of right now, the faculty must vote for furloughs in order for them to be administered. This would mean roughly a 10 percent cut in every faculty member’s pay, by implementing two mandatory days off a month. The administration still has the power to enforce layoffs if the faculty votes for furloughs. In other words, layoffs are a possible outcome regardless of how the faculty votes. If they vote for layoffs, lecturers, who are considered temporary workers even if they have taught at CSUN for 20 years, would be the first to go. A majority of the faculty at CSUN, roughly 60 percent, are lecturers. After lecturers, assistant professors and associate professors would be next. But, since the chancellor hasn’t released details to CFA about the furlough option yet, it is not definite that layoffs would still be a possibility if the faculty decided on this option. The first faculty member to speak asked what would happen if the faculty didn’t vote at all and left the decision up to the administration. “If we don’t have a vote, they can impose layoffs upon us,” said Kreysa. Montaño added that it is in the faculty’s best interests to vote in order to have a say in their futures. Some professors voiced their opposition to the furlough option and said it would be just as bad as layoffs. Others said voting for a furlough is a trap and that the administration is asking the faculty to, “wield the bloody knife ourselves.” This was met with an uproar of applause from the audience. The option of not voting came up again. Ballard said he would like the faculty to engage in a discussion in order to shape the agenda of the administration considering they don’t have a specific plan about the furloughs before they decide not to vote at all. Among the clamor of faculty, the only student to speak at the meeting was Danny Santana, 19, a history and Chicana/Chicano studies major who is also a member of Students for Quality Education, a system-wide student organization aimed at making student voices heard during the budget quagmire. He asked for the professors’ support by opening their classrooms to the students organizing an action at the chancellor’s office on July 21 in Long Beach. As the meeting progressed, faculty members began funneling their frustrations toward CFA members, especially Montaño and Ballard. Montaño criticized some of the angered faculty members for not being present at previous meetings about the budget. Others made the point that the administration is using the vote as a divide and conquer strategy in which the two undesirable choices leave faculty fighting with each other. Fischbach, who has been at CSUN for 40 years, said the CSU campuses should consider raising the standards for incoming students. He said he blames the mismanaged leadership of the union, which is supposed to protect him, for the hard decisions that lie ahead for faculty. One faculty member received the most positive response when he attempted to unite the faculty members as they quarreled and pointed fingers. “The idea of a union is that we suffer together until we get what is right,” he said. Professor of Pan African studies, Johnie Scott, compared the meeting to the ending of George Orwell’s Animal Farm. As the irritation in the room rose and chatter bounced off the walls in every direction, Santana stood up again with a new message for the faculty members. He said he has been involved with many student organizations besides Students For Quality Education, and that they have been taking action in the wake of the budget cut proposals. “This whole semester we have been holding demonstrations, rallies, teach-ins, forums about the budget crisis issue and the effect on students and faculty. We have reached out to professors and we’ve barely gotten any responses,” he said. Santana said it is important for the faculty members to hold themselves accountable as well as their leaders because only the communications, Chicana/Chicano studies, Pan African studies, American-Indian studies and education departments had responded to their requests for support. “We need your advice. We’re in this together,” Santana said. Kreysa approached Santana and put his arm around his shoulder. He seconded Santana’s reaction to ambivalent faculty members and condemned their neglect of students who have been proactive during the budget crisis. “They are here coordinating student action on these campuses on your behalf. For you. They’re here to rally the students when it comes to faculty rights and for faculty issues. This student is correct. You should be advocating for these students as well. You should be inviting them into your classes to speak out,” Kreysa said. Chair of Chicana/Chicano studies, David Rodriguez, reminded everyone about the severe economic crisis the entire country is facing. Mike Rivas, an assistant professor of secondary education, thought overall the meeting was productive. At the close of the meeting, Ballard reiterated to the faculty that the main message he received from them was not voting for either option would send a very powerful message to the chancellor. He said he would relay that sentiment to all the statewide officers as soon as possible. All students and faculty can follow the events of the meeting on Twitter.